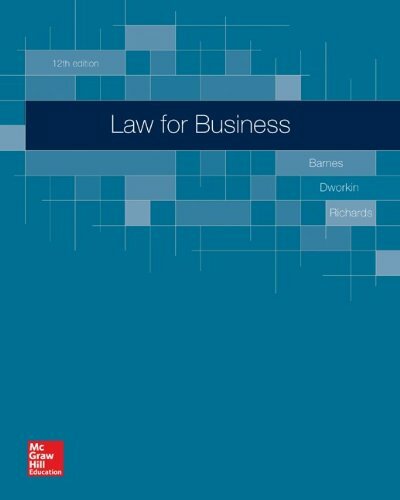 78023815 –Overview: Law for Business has set the standard as an easy-to-read textbook that provides students with the tools for understanding the legal environment of business. This, the 12th edition, has not strayed from that winning formula. The text goes well beyond merely identifying the current legal rules and regulations affecting business by offering insights into new developments and trends that promise to greatly affect the future of both domestic and international businesses. The result is a comprehensive, yet concise, treatment of the legal issues of fundamental importance to business students and the business profession. Feedback from faculty and students alike confirms that they particularly like the clear exposition, the careful selection and editing of high-interest cases, and the text’s attractive and readable design.